The Hollars is one of the most anticipating films in this 2016. Being presented at the first time in Sundance at January 29, 2016, The Hollars got so many positive reviews. There is indeed no any exact date when the movie will be shown all at once for public. However, Sony Pictures Classics, the distributor convinced that The Hollars will be released in the third quartal of 2016. The Hollars tells a story about a graphic novelist, John Hollar (John Krasinski). John lived in New York and struggled for staying alive within many troubles and problems. His work as a novelist also didn’t give him many benefits. On the other hand, there was also his mother, Sally Hollar (Margo Martindale) who suddenly has a heart attack in the morning. The heart attack which was happening when Sally already did some beauty treatments made her had an eyesore. Dr. Fong (Randall Park) a doctor who treated Sally diagnosed her for a brain cancer. The cell of cancer in Sally’s brain was detected after he knew that Sally’s former job forced her to always stand in a whole day. There is only one way if Sally wants to be free from her cancer, it is a big operation, of course with more money and much risks. John Hollar who received the news was then decided to comeback in the house where he grew up and tried his best to treat and cure his mother. His coming back fortunately gave so many changes. He must face his father Don Hollar (Richard Jenkins) and his older brother who still lived with their parents, Sally and Don, Ron Hollar (Sharlto Coplay). 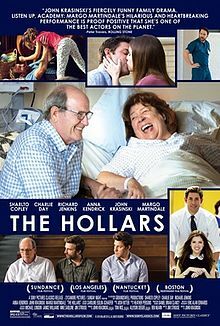 Here was the journey, drama, and even conflicts within the Hollars were started. So, is John Hollar able to pass through the problems with his dysfunctional family? You can get the answer surely by watching the movie.